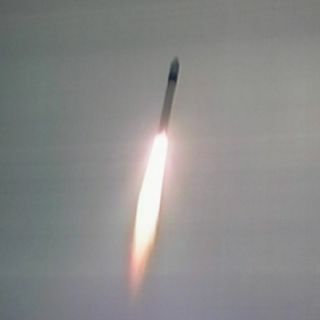 A Rockot booster successfully launched the ESA ice-watching satellite CryoSat into orbit on Oct. 8, 2005. This story was updated at 7:50 p.m.EDT. A newsatellite to help provide insight into one of the more controversialenvironmental issues being faced today failed to reach orbit to begin itsmission to monitor crucial changes in Earth's polar ice caps because its rocketbooster's flight computer had a missing command. Cryosat lifted off at 1502GMT (11:02 a.m. EDT) Saturday aboard a Rockot vehicle originating from theRussian Plesetsk Cosmodrome located in the nation's far north. The jointEuropean-Russian Eurockot firm provided the launcher, which is largely derivedfrom the Russian SS-19 missile used by military forces. However, problems arosebefore the rocket reached its target altitude for deployment of Cryosat, andthe $170 million satellite fell into the Arctic Ocean near the North Polebefore completing its first orbit of Earth. "Preliminaryanalysis of the telemetry data indicates that the first stage performednominally. The second stage performed nominally until main engine cut-off wasto occur. Due to a missing command from the onboard flight control system themain engine continued to operate until depletion of the remaining fuel,"the satellite's owner, the European Space Agency, said in a statementannouncing the launch failure. "As a consequence, theseparation of the second stage from upper stage did not occur. Thus, thecombined stack of the two stages and the CryoSat satellite fell into thenominal drop zone north of Greenland close to the North Pole into high seaswith no consequences to populated areas. "An investigatingcommission by the Russian State authorities has been established to furtheranalyze the reasons for the failure, results are expected within the nextweeks. This commission will work in close cooperation with a failureinvestigation board consisting of Eurockot, ESA and Khrunichevrepresentatives." Plans called for Cryosat tobe released at 1636 GMT (12:36 p.m. EDT) after two burns of the Rockot'sBreeze-KM upper stage. The first two stages of the rocket were to completetheir role in the flight within the first five minutes after launch. Russian ground stationswere expected to lose communications with the launcher at eight minutes afterliftoff, but the Redu site in Belgium was scheduled to acquire signals from theBreeze upper stage and Cryosat just a few minutes before spacecraft separation. But only silence was heard,immediately prompting concern that something had gone wrong. "We have noinformation on what the status of the mission is - whether separation has takenplace or not and whether the satellite is healthy," said Volker Liebig,ESA's Director of Earth Observation, said earlier in the day amid confusionover what had happened. Within six hours ofliftoff, ESA officials announced CryoSat was gone. "Jury Bakhvalov, firstdeputy director general of the Khrunichev Space Center on behalf of the RussianState Commission officially confirmed that the launch of CryoSat ended in afailure due to an anomaly in the launch sequence and expressed his regret toESA and all partners involved," the ESA statement said. This was the sixthcommercial launch of the Rockot booster since 2000. The previous five had beensuccessful for the marketing firm Eurockot. What impact Saturday's failure willhave on plans to launch a Korean science satellite in December is notimmediately clear. Europe's Cryosat satellitewas to begin its three-year mission Saturday to fly over the polar regionsusing a sophisticated radar altimeter to determine the thickness and mass offragile land and sea ice sheets and their rates of change. Cryosat was to fly in acircular orbit almost 450 miles high with an inclination of 92 degrees,allowing the observation platform to pass almost directly above the poles. The 1,500-pound satellitecarried a radar instrument to pierce thick ice sheets to precisely measure theirthickness as it changes over time. The Synthetic Aperture Interferometric RadarAltimeter device featured an operating mode to improve resolution above earlierexperiments probing polar ice, and was the first radar altimeter everexclusively designed to study the frozen ice masses. The radar would have workedby sending short pulses toward the surface and measuring the time it takes forthe pulse to be reflected back to receivers aboard Cryosat. With two antennas, SIRALwas to determine depths within just a few tens of centimeters, an unprecedentedlevel of resolution. The 136-pound instrument was largely based on the Poseidon2 altimeter currently aboard the U.S.-French Jason mission. The Ku-band radar includedseveral improvements that make SIRAL unique, including a second antenna thatprovides the across-track interferometry needed to augment results in roughterrain on the edges of large ice masses. Cryosat also included aradio receiver that gathers data from several dozen ground sites around theworld to provide position data to further refine measurements from the craft'sradar instrument. This information would have been needed to help correlateSIRAL data with geographical location on Earth. Scientists are seeking dataon changes in Earth's ice caps to help their studies of global warming and itsaffect on the planet's climate and sea levels. Land ice covering most ofGreenland and Antarctica are somewhat protected from melting by their sheersize, while more sensitive ocean ice sheets are more rapidly thinning in theArctic Ocean and on the periphery of Antarctica. For example, estimates arethat if all ice on Antarctica and Greenland were to melt, Earth's sea levelwould rise up to 200 feet. In addition, temperatures would significantly riseand climates across the globe would be impacted. Cryosat was to attempt toanswer fundamental questions in climatology and global warming, such as whetherthe reports of shrinkage of ice sheets was true on a global scale, whether thishas been induced by global climate change, and how long it will be until thisissue begins to affect human society. Copyright 2005 SpaceflightNow.com, all rightsreserved.